We look back at our chat with the fine filmmaker, who told us about his girlfriend-slash-stylist and spilled what he really thinks when he sees her onscreen. Paul Soriano is such a sweetheart. Not only is he an award-winning filmmaker (he bagged the Best Digital Film Director Award at the 28th PMPC Star Awards for his work on Thelma), he's clearly a stellar boyfriend to his girlfriend of five years, July 2011 cover girl Toni Gonzaga. Earlier this year, when the rumor mill started buzzing with speculations that Paul and Toni were soon to tie the knot, we seriously couldn't help but swoon. At a Highlands Corned Beef event last year, where Paul was proclaimed one of its endorsers, we sidled up to this fine filmmaker and asked him how he dresses for his job, how Toni steps in to style him, and what he really thinks when he sees his girl all glammed up. How would you describe your fashion sense? Do you dress a certain way for your profession? Definitely. I'd say my style is comfortable. I’m a comfort guy. In my kind of job, I’m behind the camera, so it's not important to always look your best. Honestly, for me, it's just a pair of jeans, a long-sleeved shirt that I fold up, and some sneakers. You know, when I'm behind the camera I have to be comfortable. I'm moving around, changing locations, I have to be flexible. You have to let your clothes help you with your work. Comfort is definitely key. Have you ever let Toni dictate your style? Do you think guys like it when girls do that? It’s fine, it’s fine, and she does! What she does is she buys me clothes and she tells me to wear them. It's good because she buys me clothes that I really like. She’s never bought me something or given me something that I didn’t like. So she knows my style. She just gives it a little "Toni styling", so she’s like my stylist! It’s nice, because I'm really not the kind of guy that shops much. I like wearing the same shirts over and over again. You know, if I like a shirt I buy five of the same kind, five of the same color, because it just fits me well. Toni would be like, "You’re always wearing that black shirt, let's buy you some other colors." What do you love about Toni's style? Toni’s style is similar to mine in that she’s very simple--this is off-camera--she’s a T-shirt and jeans kind of girl; sneakers, baseball cap, jacket... When she’s off-camera, she dresses the way I like to, which is comfortable. And, we can go out, no problem. But on-camera, wow, she’s really beautiful. The gowns, the accessories... She transforms into this really stunning person--not that she's not stunning off-cam!--but when I see her on TV, she's always so colorful and vibrant. 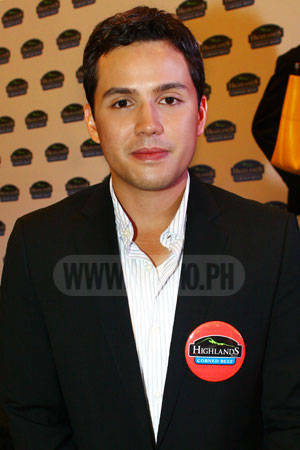 Launch the gallery to see photos of Paul at the Highlands Corned Beef press event!